CNN is premiering a new, "unconventional" weekend show hosted by comedian D.L. Hughley called "D.L. 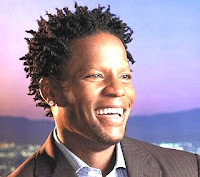 Hughley Breaks the News," which will feature Hughley's humorous take on the week's events. The show is set to start airing on Saturdays at 10 p.m. ET beginning Oct. 25 and will feature Hughley and guests discussing on politics, entertainment, sports and pop culture. Hmmmm. Although other news services are comparing this show to Comedy Central's "The Daily Show" and "The Colbert Report," we believe it is a response to Comedy Central's new David Alan Grier Show, "Chocolate News." David Alan Grier of "In Living Colour" fame has a new show called, "Chocolate News" that is a black, tongue-in-cheek program similar to "Dateline." Look at the similiarities in description: Grier's show is described by IMDb as, "A magazine-show parody hosted by comedian David Alan Grier covering urban pop culture topics." It too debuted in October. Of course Hughley has been quoted as saying that his show will be more like the late-night talk shows of Jay Leno and David Letterman. Well we love the competition. Let's call this new littering of talk shows with more black faces The Obama Effect (TOE). Better hope Obama wins, or they could disappear just as fast as they appeared. Just don't forget to have us on when discussing energy and environment.